A woman who went to the aid of a 10-year-old girl found her "howling" in a stream after allegedly being choked and raped by a teenager. The accused, who is now 17, cannot be named for legal reasons. 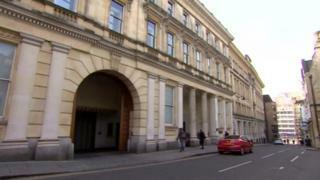 Bristol Crown Court was told the girl kept repeating she had been strangled. Jurors were told she heard footsteps running behind her before she was grabbed and dragged down a bank into the stream. Helen Bailey was walking home when she heard a child "howling and yelling" from the stream. "Her first words were, 'he strangled me, he strangled me, he strangled me', possibly more than three times. Mrs Bailey said the girl was struggling to stand up as her tights and underwear were below her knees and soaking wet. In a statement, the girl's mother said she was muddy, wobbly and confused after the attack. "She kept saying she just wanted to be normal again and wanted to go to school the next day," she said. Medical examinations found the girl's eyes were swollen and bruised, she had marks to her neck, bruising on her back, scratches on her leg and injuries to her genital area. His barrister said he inadvertently rendered the girl unconscious after they fell down the riverbank while he was restraining her around the neck. In cross-examination, the girl said: "We walked down. One of my feet slipped a bit but I didn't fall down."